When you get a new Android phone like Samsung Galaxy S7/S8 with a larger screen, higher configuration, latest operating system and refined design, you may need to transfer old Android phone data such as SMS to it. Since some text messages may contain important information such as important notes, family memories, picture attachments, classic blessing messages, etc. So how to make it? In this article, we will show you two easy methods to transfer SMS from Android to Android. Gihosoft Phone Data Transfer, a powerful Android SMS transfer software, can enable you to transfer text messages from Android to Android phone in original order, or transfer contacts from Android to Android as well as photos, videos and music within one click. It supports all smart phones and tablets running on Android 2.1 to 7.0, like Samsung Galaxy S8/S8+/S7/S7 Edge/S6/S6 Edge and Note 7/5, HTC, LG, Nexus, Motorola, Huawei, OnePlus, etc. Please download and install Gihosoft Mobile Transfer to your computer, then launch it. Then tap the “Phone to Phone” section and follow steps below. 1) Please connect the source phone from which you need to copy SMS messages to computer via USB cable. 2) USB debugging should be enabled. Then a message will appear on your Android phone screen asking you to authorize this computer, please tap “OK”. 3) Your old Android phone model name will be shown on software interface. 4) Connect the destination Android phone to computer in the same way. SMS should have been ticked by default, but you can also tick or untick other file types, like contacts, call logs, calendar, photos, videos, music, etc. 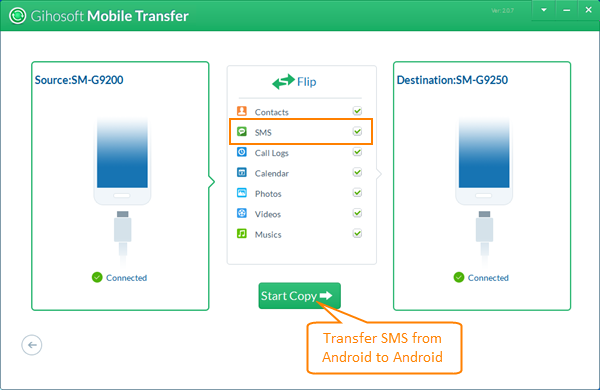 Click “Start Copy” button to begin the Android to Android SMS transferring process. Soon a pop-up message will appear on the destination device, just as the below image shows. Please tap “Yes” to transfer messages from Android to Android. Notes: During the SMS transferring process, please don’t disconnect your old or new Android phones from computer. By the way, if your messages get lost or deleted by mistake, you can quickly get them back by using this free Android data recovery software. SMS Backup+ app can be downloaded in Google Play, which requires IMAP access to your Gmail account to function. By using this app, you can easily backup all your SMS & MMS messages on your old Android phone to your Gamil/Google account, and then you are able to transfer SMS to your new Android device. Click here to learn more details about how to transfer text messages from Android to Android via SMS Backup+.